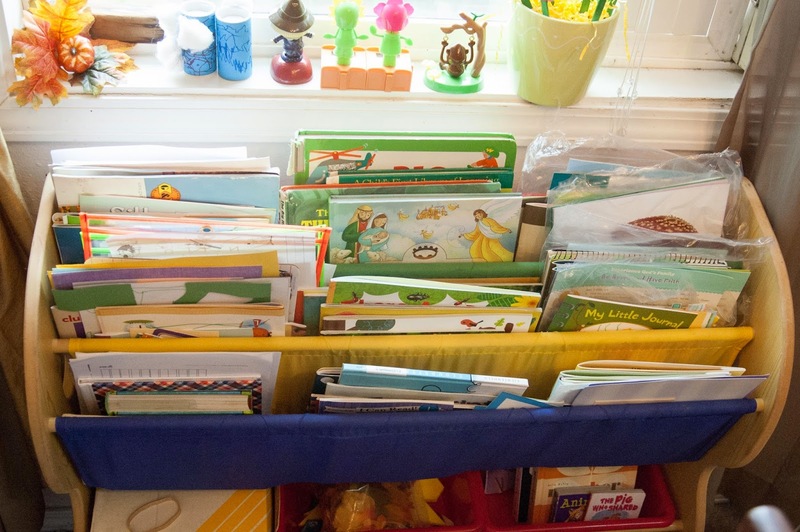 Mother Goose Time is pretty much a grab and go kind of curriculum. This is what has been so amazing about it for me and my family. The last two years I watched additional children and our days were less than routine. I often would have to fit in some sort of a lesson while someone was napping, and that time varied from day to day. I would simply grab the bag for that day, open it up and get started. No prep no planning. Now, I am blessed to just be watching my own three and we have been able to establish a great routine. From 8am to 10 am I devote all of my attention to my boys. We sit down for breakfast at 8 and get started. I use MGTs curriculum for both my Kindergartener and my Preschooler. I do the More Math and More Literacy workbooks as well as a few other things, to add to the curriculum for my Kindergartener. 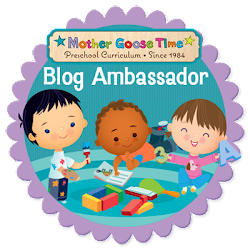 I have also started a new at home job as Blog Coordinator for Mother Goose Time. So I do a lot of blog reading and have learned a lot. Including, some of the perks of planning ahead and preparing. For now, this is what I have implemented. I have started cutting open the day bag, the day before. I post the current day and the next days topic on my wall. 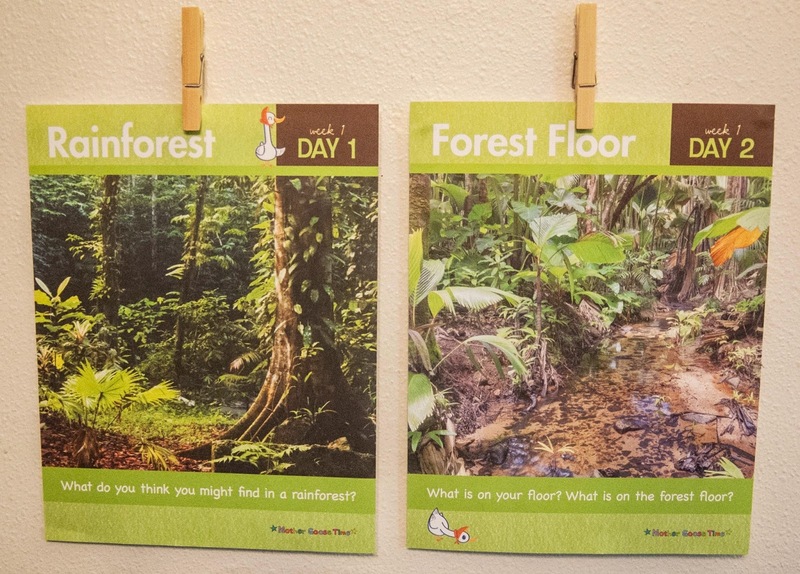 I saw this idea on Svetlana's blog at Buzz On In and I really liked the idea of them seeing what we are learning and seeing what we are about to learn. I am hoping it will get them excited and give us a picture to reference through out the day. The night before, I try to sort through the materials. Most everything you need is there, but some things need to be punched out or collected from the Teacher Tool bag. All the other needed supplies we usually have readily available to grab as we need them, like glue, scissors, markers and so on. If I don't look it over the night before, I usually have time in the morning, before we get started at 8 to look it over quickly. This just gives me the ideas and topics in my head so I can go with the flow of the day. However, I do still have my Teacher Guide out for the day. I put a little post it flag on the current days page. I tried a book mark, but it just kept falling out. So the sticky tab is the best option to quickly reference. 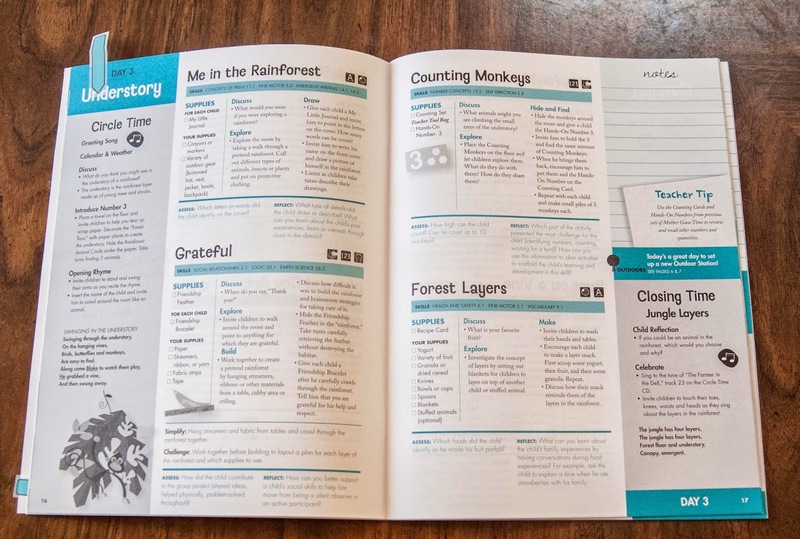 I take the guide with me where ever we go because it has some awesome discussion questions and pointers. I try not to stare at it and read directly from it, but it really has so many helpful hints. I keep our box of MGT supplies in the garage on a shelf just outside the door. Recently my Mom bought me this book sling, book shelf with trays underneath. This has become school central. On the top right I store the current weeks Day bags, so they are there, easy for me to grab. There isn't enough room for all the day bags, but a week at a time is plenty. 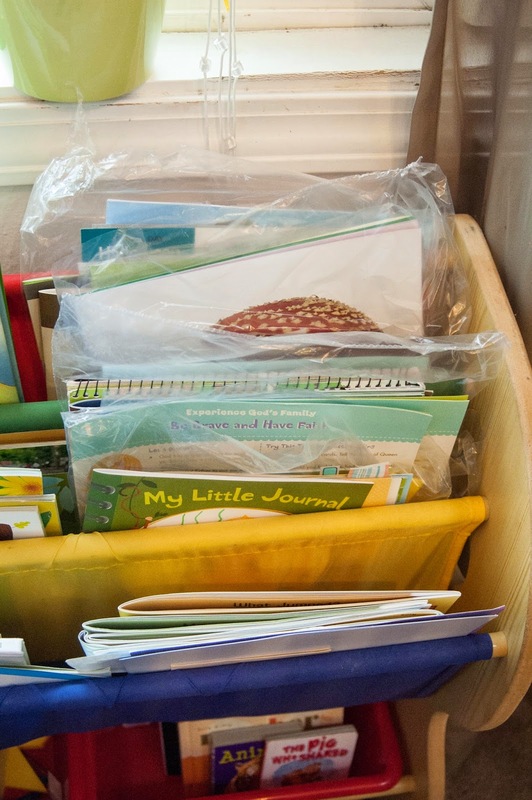 The pocket beneath the curriculum day bags, I have our Experience God curriculum as well as our AWANA Sparks book. The last pocket on that side has Lachlan's reading material. On the far left side I have a pocket of Peter's things. He has blank paper for drawing/writing. He has write and wipe pockets with things to trace in them and a dry erase writing board. I also keep their My Little Journals and I Can Read books from MGT in their pockets. In the trays below, I have been keeping the awesome manipulatives we have been getting this year from Mother Goose Time- leaves, monkey, pattern blocks and buttons. Also a tray of books for Adam when he joins us. 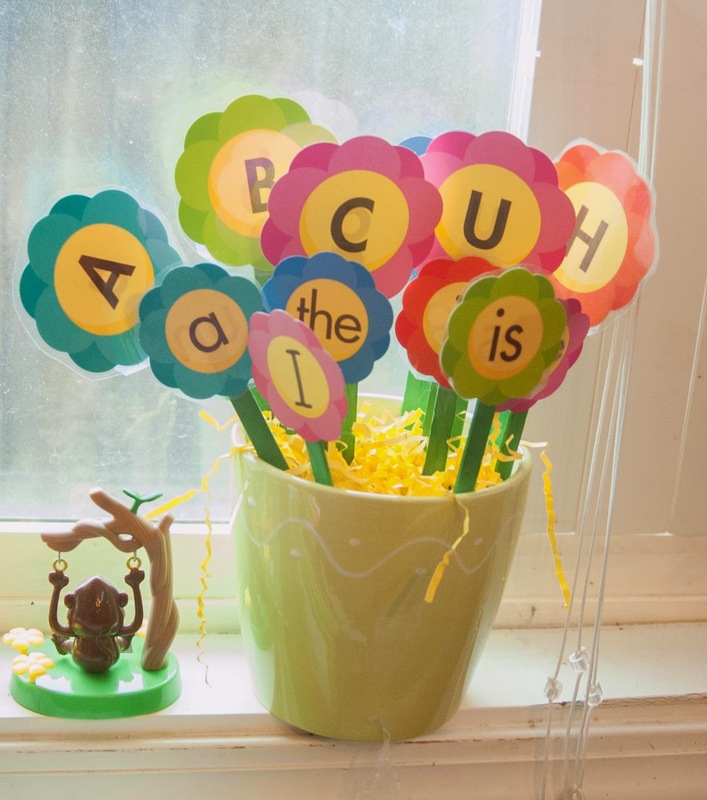 I just recently got out a flower pot with crinkled paper in it to put our past months letter flowers and sight word flowers. I think it looks pretty cute, but it will get too full at some point. I will have to file some of them away as we continue through the year. Every blogger has been doing a great job about book pairing. This I kept forgetting. So finally, this month, I planned ahead and requested some books from the library. Mother Goose Time has a book list for us, one book to go with each day. At first I just did a keyword search and searched for Rainforest books. I got those before the month started. I have a few of the books from the book list now waiting for me to pick up. I am excited to add a reading book to each days activities. The book list is under member resources and can be accessed with the code in the front of your Teacher Guide. I have been keeping the themed reading books over by my rocking chair in the living room so we can have reading time over there. It's nice to have a variety of areas around the house.